Just in case the title is misleading, “Figs & Pomegranates & Special Cheeses” is not a cookbook, just as “Mrs. Job” was not a self-help book showing married women how to get paid employment. Here’s the source of the title, – a quote from page 50 when Dara’s mom is talking to Dara about her upcoming marriage to Job. Yes, I will share some photos from the Alaska cruise, but first I need to finalize work for “Figs & Pomegranates & Special Cheeses.” With the help of two wonderful ladies, we’re getting there. Marilyn Brown on Watercolor. Jenny Janson of Janson graphics on layout and cover detail. So, Here’s what the front cover will look like when I finish the final proofreading and all the other stuff that’s needed to get it out there on CreateSpace. I guess I have to postpone the cover of “Figs & Pomegranates & Special Cheeses” for another day, and even the photos of Alaska, because this is just too important a follow-up on yesterday’s blog. The early training reported in yesterday’s blog tends to encourage the inappropriate use of “sorry.” I remember noticing at SCSU how often women said “I’m sorry” when walking through an entrance door while someone was using the exit door. Or there’s the research of women saying “I’m sorry” when someone bumps into them with the grocery carriage. I’ll bet you have some of your own stories of saying “I’m sorry.” Probably a good thing to make note of in our own behavior. I was in the midst of working on a blog to share the cover to “Figs & Pomegranates & Special Cheeses” when I came across this very wise and practical advise. I got caught up in watching it because I have so often found myself offended watching parents ordering their children to give someone a hug or kiss, even when body language says so clearly they don’t want to. It’s a scenario that says so clearly the child’s feelings don’t matter. When they are older, we teach them to say “no” and expect to be heard when someone wants to touch them inappropriately, but earlier on we tend to train them against that very protection by teaching them their consent doesn’t matter. Yes, I’ve been invisible to the blogging community since June 22, the beginning of a two-week cruise to Alaska. And I will post photos soon, but today I’d like to make some comments on invisibility, inspired by a little episode onboard ship. Let me say upfront this is not a report of stress, or even any great emotional reaction. It is simply some of my personal experiences with the documented evidence that older women – or even, women – tend to be invisible. It begins as soon as one passes through the young blonde – or brunette – or redhead – stage. Anyway, here’s where my observations begin. One morning Doug was off on a hiking excursion, so I went alone to breakfast. “And what is your cabin number?” asked the host. “6160” I replied. Throwing his hand over his mouth, he said, apparently embarrassed, “Oh my. I didn’t recognize you.” And so I was directed to the table, and gleefully reminded him of the faux pas before every meal thereafter, a reminder to which he responded pleasantly. In other words, we had a thing going. So, about being on the ship. One thing I have noticed there – and at other gatherings of strangers, is that folks always, as a way of making conversation, ask the men what they do – or did before they retired – for a career. As far as I can observe, I’m the only one who turns to the female partner to ask, “and how about you?” Often it turns out they have also had interesting careers. It just doesn’t occur to people to think of that. On the other hand, there are the occasions where the husband answers for her, “She’s been busy raising our family of six children.” A great career, I think, but what I find interesting is that he answers for her. But thinking back, I realize my experience with invisibility goes back a way. (Incidentally, I think maybe things are different now with younger people.) Anyway, for more stories. In 1980 I had the pleasure of a half-year sabbatical from SCSU. I did what I was supposed to do with it –a lot of reading on the Psychology of Women in preparation for improving my course when I would return. So, here’s my invisibility story. I was in the habit of stopping at noontime to do some exercises on the floor while listening to a New York TV station that ran the news on a banner below other programming. On this day, I heard three men’s voices deep in discussion. Then I heard a woman start to say something, to which one of the men said, “Oh, I’m sorry. We haven’t been giving you a chance to talk.” And then, I kid you not, I never heard her voice again. And there’s the time when I was the only chairperson in a group of chairmen. (Yes, one observed that we were a committee of 21 chairmen and one chairperson.) I want to say up front these were all fine gentlemen who had, indeed, encouraged my advancement. It’s just that for both men and women of the time we were like the fish who are the last to discover the water in which we are swimming. It was a little different from the voiceless woman in the TV discussion, though, because they would politely stop when I had something to say, and then go right on where they had left off, as if I hadn’t said anything. One day I said to them “Gentlemen, I feel like if I looked in a mirror, no one would look back.” I did get their attention, and,, in response to their questioning looks, I explained what I had observed about our interactions. For a few meetings after that, it was almost embarrassing as they stopped to ask my opinion and respond to it. Yes, at first it was stilted, but before long I was comfortably incorporated into the group. Then there’s my colleague and friend, Ragaa. We did tend to attract attention when we were out somewhere together – Ragaa with her lovely black hair, and mine still blonde. So it happened one time we were having dinner in a hotel dining room. We were there for a weekend conference. To some men at a table near us, we were not, in a sense, invisible as they were clearly hitting on us. We let them know we were discussing work. “What are two lovely ladies doing at a work conference?” they asked. That was basically the end of the cross-table conversation. One final story, and then I hope you’ll have your comments and observations to add. This one has to do with “A Healthy Woman is a Crazy Person,” the theme of the talks I did around town. They were so popular that people displayed the phrase on bumper stickers. My colleague Bob and I decided it would be a good marketing idea to sell T-shirts with those words on them. So, I made an appointment with a lawyer to learn what we needed to do to accomplish our goals. Bob and I arrived on time and the secretary called Bob by name into his office. (Of course, the invitation was intended for both of us.) Bob sat to my right as we both faced the lawyer with his long yellow pad across the table. I gave him the information about what we wanted to do and he took copious notes. Then he looked at Bob to explain what needed to be done and – I swear this is the truth – never looked at me again except to shake hands on departure. If you ever meet Bob and talk to him, he will validate the story. And so it has gone. Today I’m not so sure I want people to notice me anyway. Well, that’s not true. 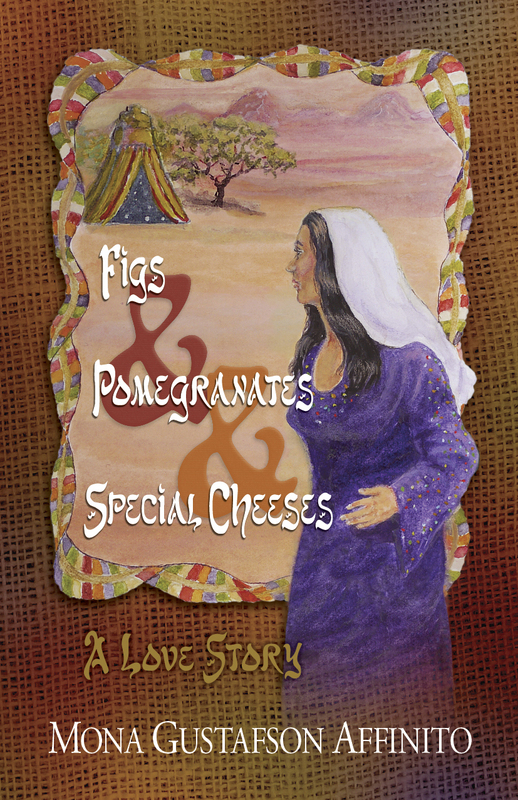 I’d love to have folks seeing me at book signings when “Figs & Pomegranates & Special Cheeses” hits the market.